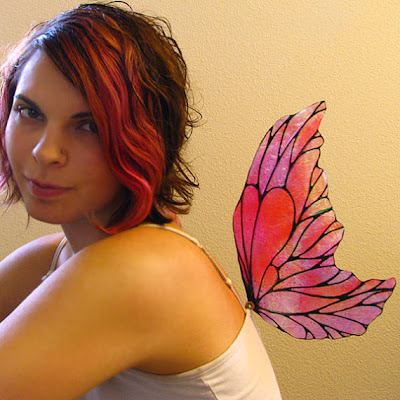 My daughter Dani's newest venture is to make and sell fairy wings. She is best known for her articulated angel wings, and has in fact sold many pairs, including one that was used in a music video! These new wings are just beautiful - far more colorful and iridescent than photos can show, and they are also translucent. The set that I got from her are very similar to the ones she's wearing in these photos. 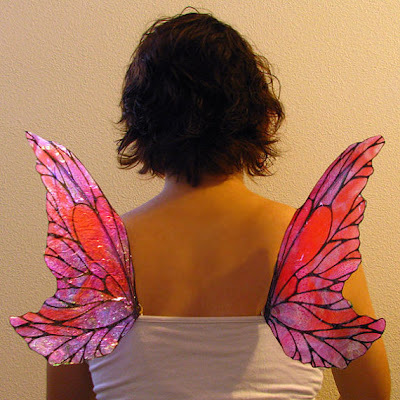 If you know anyone who wants to be a very realistic fairy for Halloween, you can send them to TruWings on etsy. These are not your typical "stretch a pair of stockings over a wire frame" wings! Those are beautiful wings that your daughter makes.